I’ve managed to research the history of this infamous church, which dominates a lot of Plantersville and Georgetown’s history. Once billed as Prince Frederick’s Episcopal Chapel, Old Gunn Church was established in 1734 in Plantersville, South Carolina. The church was originally part of the Prince George Parish here in Georgetown, but was later separated and the congregation moved to its present location on the outskirts of town just off Hwy 701. It became a very popular place of worship amongst rice plantation owners that lived in the Waccamaw Neck area along the Great Pee Dee River. Throughout the rest of the 1700’s and about half of the1800’s the church was very active. Rev Hugh Fraser had donated the property the church is currently located on in 1835. The reverend enjoyed and often preached reverberant sermons from the pulpit inside. In 1846, Joseph Hunter took the pulpit as a Unitarian Theology preacher (preaching about one deity versus a trinity). He frequently included and used antiquarian analogies to his preaching (historical and ancient teachings). His sermons gained so much popularity, almost doubling the congregation in size, that by the mid 1800’s it became apparent they were going to need a larger and bigger chapel in the church. 1859 was a crucial year for Prince Frederick’s Chapel and for Rev. Hunter, as it was the year the Gunn brothers were hired as architects and contractors to expand the size of this beloved chapel. Their plans included a gothic structure of enormity. However, less than a year after construction began one of the Gunn brothers slipped off the steep roof and fell to his death (in 1860). As a result, the construction of the new gothic renovations to the parish completely halted. The Civil War, which began in 1861 and ended in 1865, all but destroyed the unfinished church. The building remained abandoned until after the war, but in 1876, someone donated a handsome amount to finish the construction of the establishment and bring about its once lustrous glory. However, the congregation never was the same and the parishioner's eventually just faded away. In the 1950’s, the church, now called and known as, Old Gunn Church, officially closed off the property. It has since been fenced in preventing visitors from touring the grounds and church graveyard. 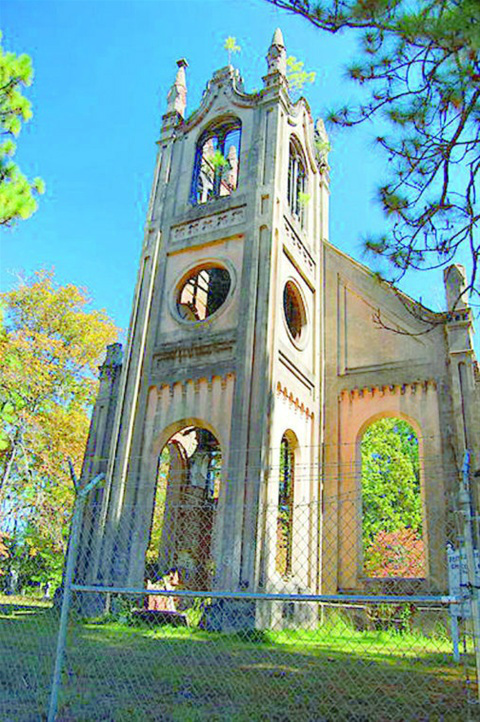 The church (officials) were afraid the structure would collapse and someone would be injured so they dismantled the building leaving only the bell tower from which Mr. Gunn had fallen to his death. The remains still linger filled with folk lore and legend. I had the pleasure of walking through the graveyard about fifteen years ago. I noticed many of the grave markers to be well over 150-200 years old. I also noted the Flagg family, a once very prominent family in Georgetown, also has gravestones in the cemetery. As I strolled about, I felt a very distinct presence and had the feeling of being watched, possibly followed. I definitely had a sense of curiosity overwhelm me from an unseen presence. Now, no one can access the bell tower that remains erect, minus the bell it used to house. However, that doesn’t stop many Georgetown residence of seeing lights illuminate the tower anyway. Some say you can still hear Mr. Gunn screaming as he falls to his death all over again. The most chilling story I’ve heard is that if you’re at Old Gunn Church between the twilight hours of sundown and dusk, you can still hear the boisterous singing of a phantom choir resounding from inside the chapel that no longer stands.